My first skatedboard was the 1983 Variflex Allen Losi deck, featured above alongside Lance Mountain’s and John Lucero’s decks. I was a huge fan of Losi (I was also a fan of Mountain, but who wasn’t a fan of Lance Mountain?) in the early 80s, and the video below of Losi at the Del Mar Skate Ranch in 1985 is a good indicator of his style. I would imagine by today’s standards some of his fluid, handplant-rich style might be consider quotidian. He was a grinder, his sets were full of backside bonelesses, lap-overs, fakies, 50-50s, and interspersed with blasts of air. And why some of these tricks might seem unremarkable given how insane the sport has gotten, for my brother and I they were awesome. 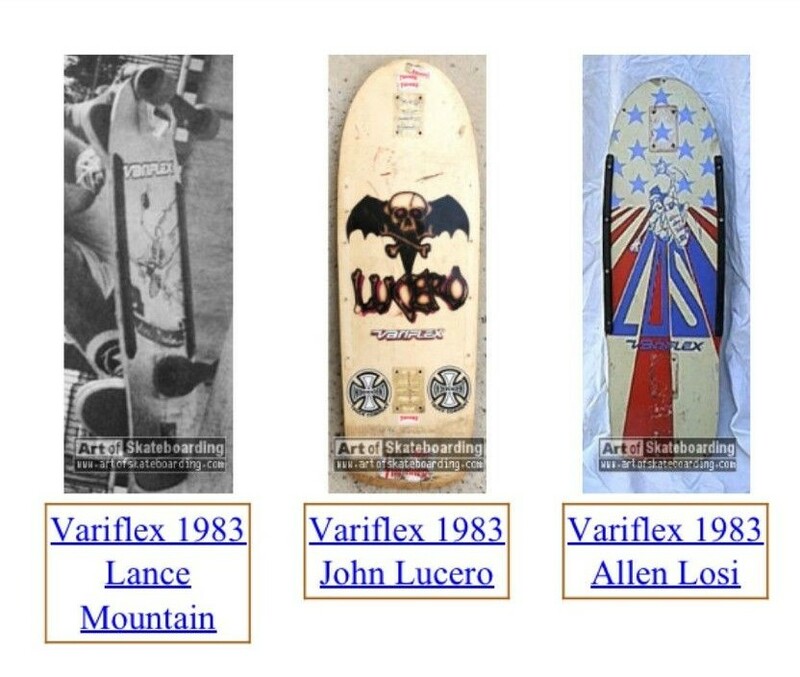 We revered lesser known skaters from the 80s like Neil Blender, Lester Kasai, and Jeff Phillips. The joy of wathcing them was not necessaily the precision of their tricks, but a sense of style and fluidity that made it all seem real and human. As much as I love Tony Hawk, I mean he is the best vert skater the sport has ever seen, and he’s nothing short of a trick machine. At the same time, his mechanics were less than exciting in that you knew he was going to make it, his precision left little to the imagination. Awesome, but not all that human. Skating was a subculture in the early 80s, premised on illicit halfpipes, hijacking backyward pools, punk rock, and transgressive spirit that made the celebration of precision somewhat hard to reconcile. This entry was posted in skateboarding, skating and tagged Alan Losi, skateboarding, skating, Tony Hawk. Bookmark the permalink. Yeah, you could really feel that subculture, that ethos is every one of those issues. Transworld tried a few times to copy Thrasher and just didn’t make it. I remember you would go to Transworld for the nice, glossy pics to rip out and hang on your wall, but you went to Thrasher to feel like you were reading a journal of your life. I mean, I remember reading an editor that the guy wrote in the bathroom describing his activities in there while also ruminating on how to best attack some crazy street obstacles he found and how that all related to feeling like he was touching the face of God (which I think was a reference to that poem they used to play on some networks late at night before they used to sign off). Oh, and those tape comps they used to put out? Insanity! The good songs were awesome, and the bad songs were so bad they were awesome. Skatemaster Tate doing the skate rock rap? Crazy. But McShred, Slammin’ Watusis, Agent Orange… great stuff. I need to dig out the mp3 rips of those I found a while back. Now I am wanting to see skateboarding ed tech zombies attacking Dr. Oblivion for your UTA keynote 🙂 Or something similarly crazy. Nice post. I am an old school skater also. First Pro deck was a John Lucero when he was riding for Madrid pops got it for me at PD’s Hot Shop in Vancouver when we were visiting in 1986 for the World Expo. Hoping you have seen Bones Brigade Doc and Rising Son: The Legend of Skateboarder Christian Hosoi nice to step back. Nice, Madrid is a something I haven’t heard in regards to skateboarding in a long time, so good. I’ve seen the Bones Brigade, but Rising Son is new to me—thanks for that. One of my favorite was the Vision documentary with Gator Rogowski running out of his house saying “yeah, yeah, yeah!” My second or third deck was a Lester Kasai, so that Vision doc was awesome because it was one of the few places you could see Kasai skate. As for Jake Phelps, he is a hero of mine, in fact Thrasher was one of the great 1980s documents of the skate mentality of burnt-out urbanism, and the hardcoore mentality it lost in the 90s and 00s.